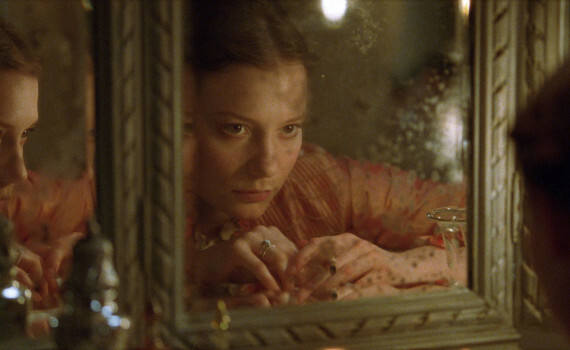 As Mia Wasikowska is the undeniable star of Madame Bovary, with a parade of male characters existing only to drive her actions, decisions, & emotions, the film lives or dies with her performance. She’s not my favorite actress, coming across too often as too cold, too emotionless, and too over-dramatic trying to make up for it. When I first saw the trailer for this film, I thought that perhaps these qualities might actually aid her in a period piece, revamping her Jane Eyre fame, and allowing her to fit in where her style so often just does not. And I was doubly hopeful after seeing her in Tracks, a film set in her native Australia and directed by the great John Curran. She shone in that role, appearing to be at ease with her character for perhaps the very first time that I had ever seen. But, alas, a hard-headed camel training explorer is not the same as an 1800s French wannabe aristocrat, and Wasikowska turned my new faith sour. Based on the 1857 Gustave Flaubert novel of the same name, Madame Bovary is a tragic tale of misguided desire and the inability to find happiness in a life more ordinary. The plot of the film is quite similar to that of the book, though not in every detail, including the deletion of Charles Bovary’s story and the omission of the birth of a child named Berthe. The movie begins with the young life of Emma Rouault, a girl of the French countryside who has always dreamed of the Parisian life and all things wealthy & romantic. She is married to a provincial doctor, Charles, moves into his home, and begins a quiet existence defined by routine, minimalism, and the unexciting progress of day upon typical day. She yearns for a more passionate existence, a more glamorous city, a fancier home, and begins to seek these things out, to the detriment of her new life. It begins with an innocent attraction to the young & emotional Leon Dupuis, a clerk who loves poetry, music, and romance. Emma longs for a life filled with these things, and yet understands her role as a married woman and the head of a doctor’s household. But her restraint will only last so long, and as the days pass her self-control begins to weaken. Although money isn’t abundant, she begins to decorate her home & wardrobe in expensive styles, forcing the world around her to fit the image she had when she was married all those years ago. And she begins an affair with a marquis who is the man she pictured herself with before her world turned colorless. These irresponsible actions lead to more & more problems, spiraling out of control until Madame Bovary’s very life is a contemptible ruin of what it could once have been. Admittedly, I didn’t know exactly what I was getting myself into, having not read the book. The film was much less a period piece and much more a Shakespearean tragedy, which was not what I was expecting. Yes, the sets & clothes were period and the era was well-represented, but the film did not play like your typical Keira Knightley romance movie. It was darker, more Gothic, slowly driving audiences insane as the main character slunk deeper & deeper into depravity. Although, that might be a little melodramatic, since the movie is no Quills, not even an In Secret, never allowing itself to be as dirty as it could have become. Still, it’s no walk in an orderly French garden, and the few nods to the time period were soon left behind as the story became more about Emma and her overwhelming desire for something else, no matter what the cost. And I could have gotten on board with such a story, an irregularly dismal costume drama, had the actors involved sold me on the mood, but unfortunately they did not. Mia Wasikowska failed to live up to the slightly higher-than-normal expectations I’ve been developing for her after I had almost written her off as an actress. She was very dead when she wasn’t emoting, over-theatrical when she was, and always seeming out of place. Part of that is her look, which is so singular that I can’t believe her as anyone other than herself. Her affairs weren’t much stronger, as both Marshall-Green & Miller were lackluster rather than exciting. 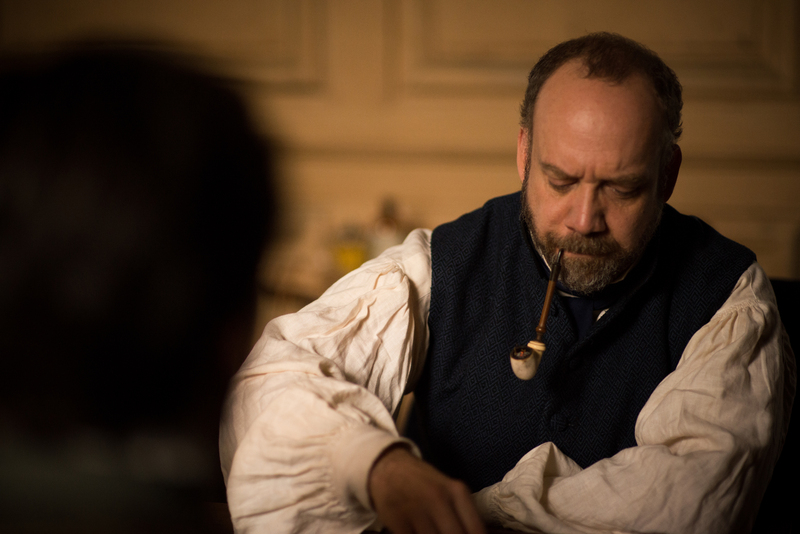 Lloyd-Hughes was surprisingly good as the simple doctor, Mr. Bovary, and Paul Giamatti delivered like he always does. But their roles were too small, too unimpactful, and Wasikowska’s poor performance doomed a film that was probably too gray to be much more than a mediocre period piece anyway. Video – With an aspect ratio of 16×9 Widescreen, the video quality wasn’t nearly as high as you’d expect from this genre in this format. The Blu-ray disc was unimpressive at best, as the film failed to highlight a clarity that could have been well represented. The picture quality was fine, but overly dark and without punch, using color only when it related to Emma’s clothes, and then making too obvious a contrast between her & the surrounding world. Audio – The Blu-ray has two audio options: English TrueHD or English Stereo 2.0. It also has two subtitle choices: English SDH or Spanish. The sound quality was fine but underwhelming. The music, though well-chosen, often overpowered the senses in scenes where there was no dialogue, thundering aloud before the film returned to subtle, whispered voices. Extras – The only special features on the disc are five previews: Madame Bovary, Fading Gigolo, Elsa & Fred, Welcome to Me, Accidental Love. Rent It. For a period piece, at least it’s something different. For a romantic tragedy, it’s a little boring. And for a world-famous literary classic turned Hollywood film, you’d think they’d have done a bit better. As it is, Madame Bovary is Gothic lite, Knightley-less, and somewhat uninspired, succeeding in not being terrible but missing the intended mark by a mile. Mia Wasikowska will never be my favorite actress, and I wonder if she’s only stellar when being herself, since she has enough talent to be someone else, but not quite as much as the actors we’ve become accustomed to enjoying. The video quality of the film was disappointing, the audio was only fine, and there were barely any extras on what became a fairly unimpressive Blu-ray disc. For genre fans, this is a fine film, though it lacks the length & depth & beauty of those that you might love. For romantics, don’t expect a happy ending.